As you all know by now, I’m obsessed with Indian food. The spicy, complex, warming curries over a bed of fresh rice is the ultimate comfort food for me. It’s probably become my favorite international cuisine by now (yes, possibly more so than Italian), and Matt and I really enjoy cooking up Indian meals at home because ingredients are cheap, it’s relatively healthy, and it’s downright DELICIOUS. As an engagement present “we” (really me) were given The Indian Cooking Course by Monisha Bharadwaj, and although I had to put cooking the recipes on hold while I was dieting in January, I’m ready to dive in! 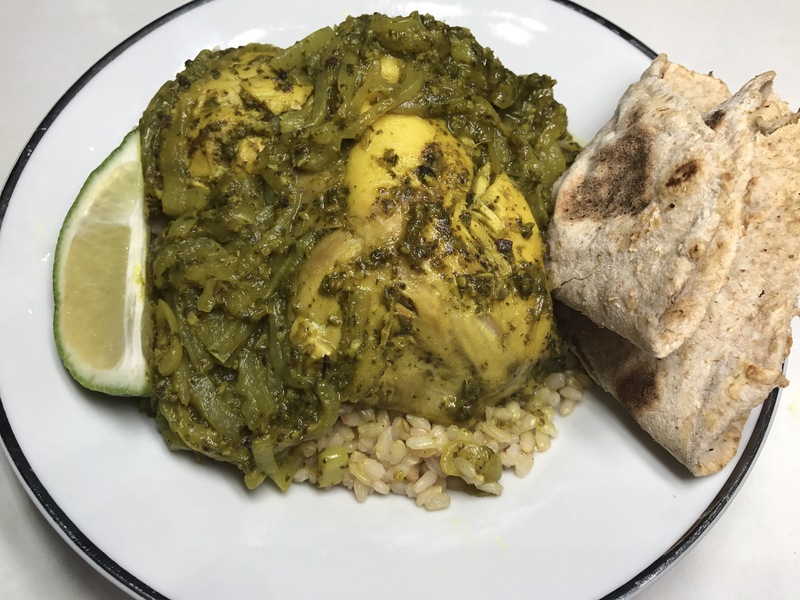 First on the list of recipes to try was this Chicken Cafreal, or Goan Green Chicken, because I had almost all of the ingredients and it is totally healthy! I read through The Indian Cooking Course entirely in about an hour the day I got it. I had been telling Matt for a while that I needed a good comprehensive Indian cookbook since we love making recipes at home so much, and I really wanted to broaden my horizons with Indian meals. Usually Matt and I order Indian about once a week (typically Sundays after a day of football and beer), but the buttery and creamy curries along with all that white rice are no bueno when you’re trying to get a wedding bod. By learning to make meals myself I can venture outside my usual paneer makhani or shrimp curry and know exactly what I’m putting into it, so that I can track the calories and nutritional info. Of course skimming through the cookbook I was immediately attracted to the creamy coconut curries and tikka masala, but I wanted to try something different and with minimal fat. I settled on the Goan Green Chicken because it called for minimal oil; the rest was all fresh herbs and spices. Also, since I have most of the spices already in my pantry I really only needed chicken and some cilantro from the store. This meal took a little longer to get together because I wanted to toast and grind the spices myself (fresh spices are more flavorful than using pre-ground spices) and I also had to let the chicken marinate for an hour. Aside from that cooking is relatively easy and quick, only about 30 minutes in one pan. I also decided to make some homemade roti and cumin-lemon brown rice as a side while the chicken was marinating. Homemade roti is pretty simple, you just need water and flour! Definitely use whole wheat flour. For 10 rotis you take 2 cups whole wheat flour and mix in ¾ cup water or as needed, until it forms a dough-like consistency. Roll it out on a floured board for about 5-10 minutes, adding more flour if needed, and form into a ball. Let it rest for 10 minutes. Then form the dough into small balls the size of a small lime, and press it into a disk and roll it out into a circle about 5-6 inches around. Then heat a pan or griddle over medium-high heat and lay the roti in the hot pan. It will puff up slightly from the heat, so gently push the roti down with a spatula to cook it all the way through, and cook on that side until golden brown circles appear. Cook the other side the same way. For the rice I just headed a teaspoon of oil in a sauce pan and, when hot, added a ½ tsp cumin seeds and toasted until darker brown. Then I added in a cup of brown rice and coated with oil, and then added in 2 cups water and simmered covered until the rice was absorbed. I finished with the juice from half a lemon and fluffed with a fork. Both sides worked wonderfully with the Green Chicken. It was just liquidy enough to cover the rice with juices but it was solid enough to eat without rice if you wanted to. The flavor was awesome; it was so fresh and bright and the meat was tender and juicy. It was a perfect mix of spicy, salty, and warming. And it was so simple! I definitely will make again next time I’ve got a big bunch of cilantro and chicken! Heat a small pan over medium high heat. Add in the cumin and coriander seeds, peppercorns, and cinnamon stick and toast until browned, about 30 seconds. Remove from heat and finely grind with a mortar and pestle or spice grinder. In a food processor, add in the cilantro leaves, jalapenos, vinegar, ginger, and garlic, with a splash of water, and puree together. Add in the ground spices, turmeric, and salt, and combine thoroughly. Pierce the chicken legs with a knife, and put in a container along with the pureed spice and cilantro mixture. Coat chicken completely and marinate for at least an hour or overnight in the fridge. When chicken is done marinating heat oil in a large saucepan over high heat. Add onions and sautee until soft, about 5-7 minutes. Then add the chicken and sauce and cook chicken until just sealed, turning over when needed. Add in a splash of water to cover the base of the pan, stir all together, cover, and simmer for 30 minutes over medium heat turning once or twice. By the time the chicken is done cooking most of the water should have evaporated from the pan. 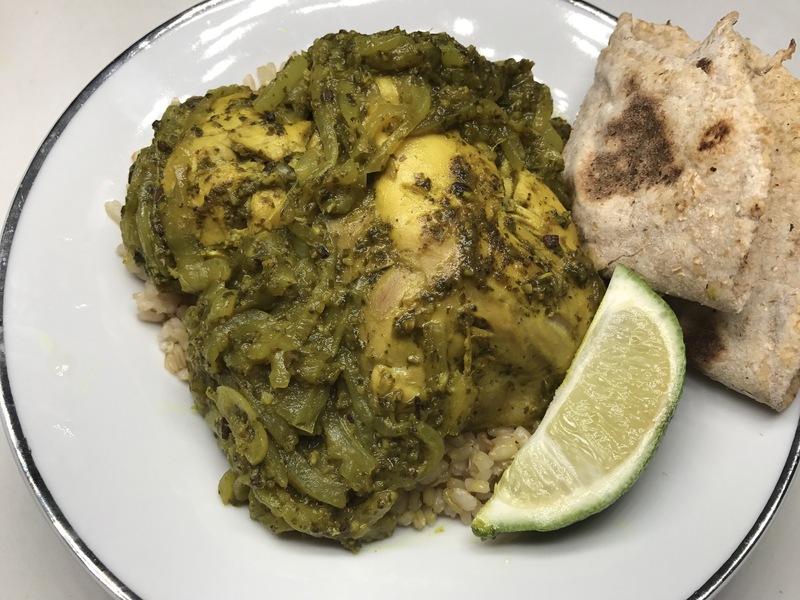 Serve the curry over rice with a garnish of lime. *Recipe adapted from The Indian Cooking Course by Monisha Bharadwaj (2016).